Colorado Avalanche forward Jamie McGinn spent last Sunday tweeting his excitement over Bubba Watson’s thrilling victory at Augusta, where the legendary Masters golf tournament is held every year. Now, the rest of the Avs and he can feel free to channel their inner Tiger Woods any day of the week. Thursday night, many Avalanche fans were clinging to a very small hope that their team could still find a way to capture the 8th seed in the Western conference, until a loss against the last place Columbus Blue Jackets officially eliminated the Avs from playoff contention. They had been slumping lately, dropping 6 of their last 7 contests of the season and failing to make the playoffs for the second consecutive season, a first since moving to Denver in the 1995-96 season. The success of the 2011-12 season should not be overlooked,however. The Avalanche made several strides in the right direction. Team defense improved almost 20 spots in the league rankings, Semyon Varlamov and Jean-Sebastien Giguere provided the best goaltending Colorado saw in years, and special teams became a strength of the team (even if chances were limited). Gabriel Landeskog is the favorite to win the Calder trophy in many eyes, and Ryan O’Reilly could see some love for the Selke trophy, as the league’s best two-way player. Peter Mueller is just one of several tough decisions the Avs will have to make. 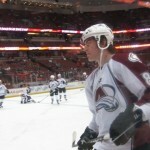 However, look for the 2012-13 version of the Colorado Avalanche to have several new faces, yet again. The Avs recently renewed the contract of head coach Joe Sacco, which marks the first of several major decisions the team must make. Management must decide on 15 total restricted and unrestricted free agents, since the franchises policy states that never discusses contracts during the season. With these free agents also comes almost $50 million in cap space, which could allow Colorado to make noise in a free agent market that includes: Ryan Suter, Alexander Semin, and Zach Parise. Expect Colorado to not make many large-scale moves such as signing Suter or Parise, although it remains a possibility. Instead, the Avalanche could look to their own farm system, which includes forwards Joey Hishon and recent NCAA champion Paul Carey, as well as OHL leading scorer Michael Sgarbossa, recently acquired from San José at the trade deadline. The team also will try to find permanent roster spots for young defenseman Tyson Barrie and Stefan Elliot. The Avalanche are seen as a team on the rise, but still a year or two from seriously competing against Vancouver for the division crown could benefit from another year allowing young players to gather much-needed experience. Another crucial moment this offeseason takes place June 22-23 in Pittsburgh at the NHL entry draft. The Avalanche have no first round pick this year since trading the Washington Capitals for Varlamov. It’s possible the Avalanche could put together a nice package of potential free agents together for a teams first round pick. Players such as David Jones or Matt Hunwick, who most teams could benefit by having, could land Colorado a pick in the top 30. Over the next several weeks, we’ll be looking deeper in to these issues. Free agency, the draft, resigning Sacco, and Colorado’s farm system all adds up to a very busy and intriguing few months in Denver. The team has some obvious needs, and has several ways to solve them. This could be the biggest offseason in Colorado since the signing of Paul Kariya and Teemu Selanne in 2003. Fans and organization alike can only hope it ends up being more successful than that.